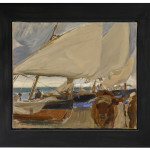 This painting will be included in Blanca-Pons Sorolla’s forthcoming Joaquín Sorolla y Bastida catalogue raisonné as no. BPS 2077. Valencia, with its sunny beaches, provided constant inspiration for Sorolla throughout his career. He delighted in depicting the local fishermen, often accompanied by hefty oxen, hauling in their boats after a day’s catch. As Sorolla himself proclaimed, “Valencia and its beaches have absorbed my entire existence.” (C. Brinton, “Sorolla at the Hispanic Society,” The International Studio 37, no. 145 (March 1909), pp. iii, xii). If Valencia provided the setting for Sorolla’s subjects, it equally inspired him to perfect his plein-air technique, thereby crowning him as one of the greatest modern masters in evoking the everchanging light and color of his natural surroundings, especially the seashore. The present work, painted on El Cabañal beach in Valencia in late summer 1910, is representative of Sorolla’s best plein-air paintings. Larger than most of his oil sketches, the subject is defined by a virtuoso handling of the paint and a vibrant palette. 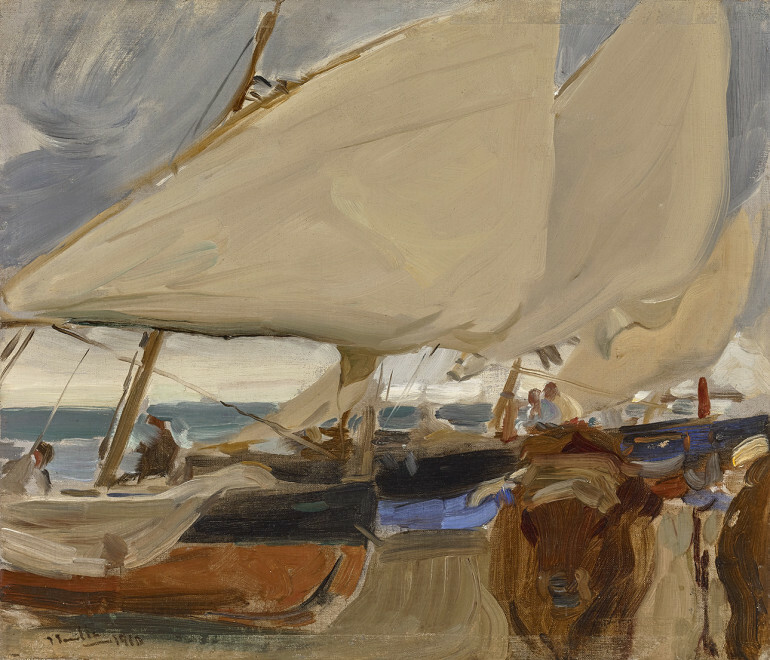 With very few brushstrokes, Sorolla has perfectly rendered the billowing sails of the boats and the bustling activity of the fishermen. 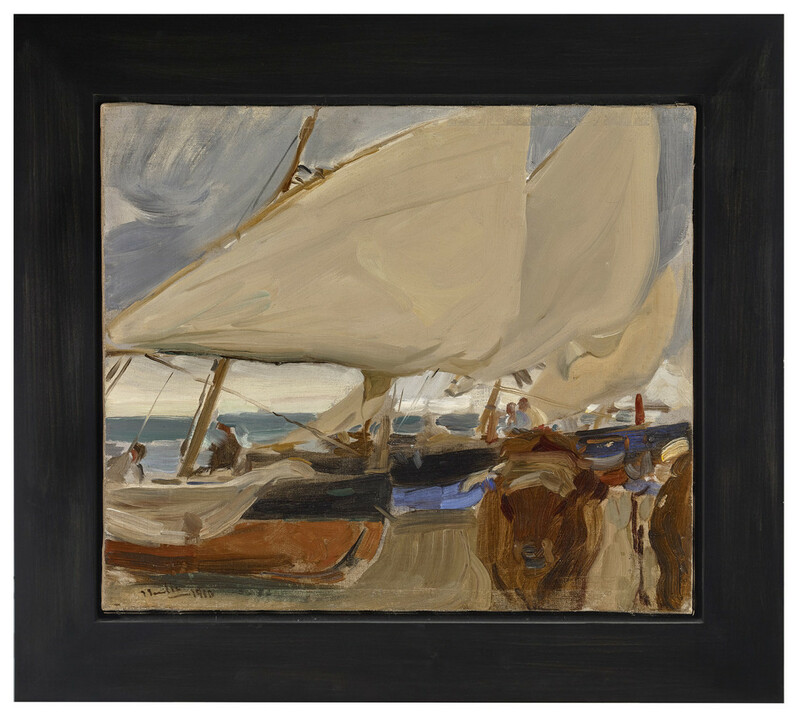 Sorolla’s oil sketches were so highly regarded that a large selection was always included in major international exhibitions of his more conventional paintings, where “every color note was a little talisman that magically encapsulated the essence of its painter’s talent.” (Blanca Pons-Sorolla and Mark A. Roglan, ed., Sorolla and America, exh. cat., Madrid, 2013, p. 221). 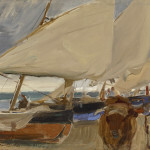 Exhibited in 1911 at Sorolla’s second American retrospective held at the Art Institute of Chicago, Playa de Valencia was purchased by American businessman and entrepreneur, Frederick Forrest Peabody.